From Kusadasi, you travel to the St. John's Basilica, by passing the Byzantine fortress at Selcuk and the ruins of the Temple of Artemis then continue to the House of Virgin Mary, is long and winding but with great vistas of the valley. After the visit drive down to Ephesus's upper gate. 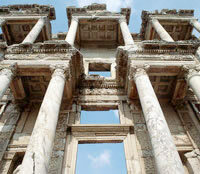 By the end of touring Ephesus, return to Kusadasi. - Approximate time to reach to The Basilica of St. John is 25 minutes.